Much of the food industry in America is one big marketing ploy. Slapping on labels such as diet, low fat, sugar free, heart healthy, and fat free is just part of everyday life now. We look around and see it everywhere. Ninety percent of our grocery stores are made up of these kinds of food. Meats, fish, fruits, and vegetables don’t need to be labeled healthy. Everyone already knows the benefits of eating such foods. Do you really think a vegetable company needs to tell customers that the vegetables they grow are healthy? Of course not; there is no need to. The reason food companies label there foods as “diet” or “fat free” or “heart healthy” is to draw in the customer that believes anything they see. Lets look at Yoplait Yogurt as an example. Yoplait is known for labeling their yogurts as “99% fat free” or “Light” or “Fat Free” or “under 100 calories”. At first glance, this looks pretty appealing. They have tons of great flavors (yes, I used to eat this stuff all the time), their packaging is eye catching, AND its “low in calories.” Why not buy it, right? Ingredients: Cultured Pasteurized Grade A Low Fat Milk, Sugar, Strawberries, Modified Corn Starch, High Fructose Corn Syrup, Nonfat Milk, Kosher Gelatin, Citric Acid, Tricalcium Phosphate, Natural Flavor, Pectin, Colored with Carmine, Vitamin A Acetate, Vitamin D3. In one 6 ounce carton, you get a nice serving of 27 grams of sugar (it is the second ingredient after all) and 33 grams of carbs with nearly all of it coming from the sugar! This sounds comparable to a pack of swedish fish if you ask me. Just for you, I did look up a pack of Swedish Fish to compare. The results: 20 Swedish Fish (one pack) has 31 grams of sugar and 38 grams of carbs. That is only 4 more grams of sugar and 5 more grams of carbs than our “healthy” Yoplait yogurt. 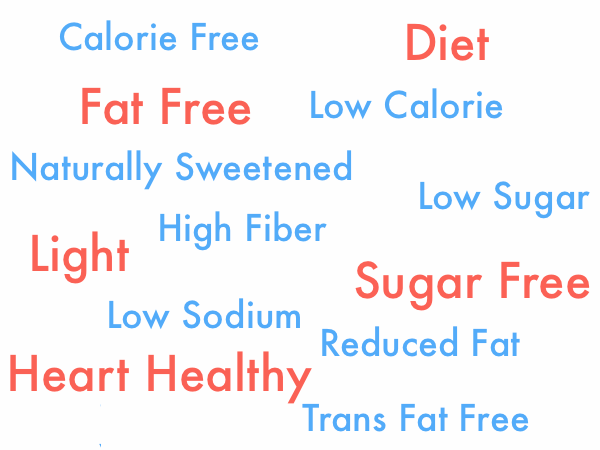 So what about all those products labeled as “diet?” What can we take from them? 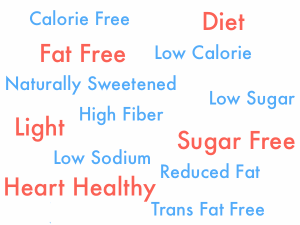 First off, you must take a look at the ingredients… Below I pulled one of the most popular “diet” products in the world to dissect: Diet Coke! The number two ingredient we see is Caramel Color. This sounds harmless but is one that is quite dangerous. Coco Cola describes it as being “made by a process involving the heating of corn or cane sugar and other carbohydrates to achieve the desired color.” — Coca-Cola Co. Sounds like drinking a science experiment to me… Heating corn, cane sugar, and “other carbohydrates” to achieve the desired color? That just doesn’t sound right! And what about ingredient number three, Aspartame? I have touched base on this before, but aspartame is a low calorie sweetener. So what is dangerous about this low calorie sweetener? Scientists have concluded that aspartame may actually be used into tricking your body to gain weight. The reason for this is because our taste buds can sense sweetness, which leads our bodies to crave calories. When we don’t give our bodies the calories it wants, many times this will lead to overeating. So although you are drinking a “diet”, zero calorie drink, the backend is where you are getting hurt. Plus, the chemicals you are putting into your body don’t help much either. The bottom line is that foods that need to be labeled as “healthy” are usually the ones you should avoid. Don’t ask me how a Diet Coke got labeled as “heart healthy” or how Yoplait Yogurt got placed as a “healthy” food when it should be considered a dessert. My challenge to you is to simply take a look at the foods you are putting into your body. Don’t fall for the “diet”, “fat free”, “health healthy” schemes without questioning first. There are plenty of incredible foods out there that will bring far more benefits than the chemical filled “diet” and “fat free” labeled foods. Answering yes to the first two questions should be enough to determine if a food is healthy for you or not. Nutrition is simple, so don’t overcomplicate it. Remember, you do not (and should not) cut out all junk food (learn why). As humans, we enjoy eating foods that are not so good for us. So that is why you should have a cheat day once per week or enjoy a few cheat meals throughout the week. Don’t strive for perfection. As I like to say, “health and fitness should not run your life, it should simply be part of it.” Enjoy eating the foods that make you feel great, then go crazy on junk food when the time comes! Leave some feedback below and don’t forget to hit the ‘Like’ button! The Food Industry A Scam?